Bring a piece of New England folk art into your home for the holidays with this hand crafted Chalkware Santa. The art of molding plaster of paris, referred to as chalkware, into holiday treasures is a centuries old German tradition. Inspired by the German tradition of folk art chalkware, Bittersweet House Folk Art offers a unique, hand crafted treasure that will last a lifetime. 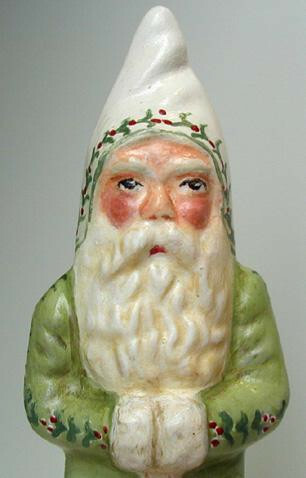 This charming German Belsnickle Santa figure was cast using a wonderful antique German chocolate mold , stands 5 3/4 inches, and is signed "Bittersweet House Folk Art, K. Campbell, 2005, Sherborn, MA".